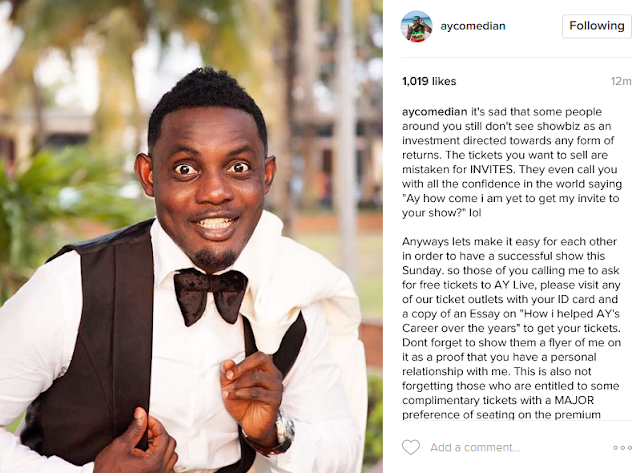 Comedian AY, took to his social media pages to chastise those who have been calling him up for free tickets to his show, as if he doesn't have bills to pay and a family to take care of, lol. Read what he wrote below..
Anyways lets make it easy for each other in order to have a successful show this Sunday. so those of you calling me to ask for free tickets to AY Live, please visit any of our ticket outlets with your ID card and a copy of an Essay on "How i helped AY's Career over the years" to get your tickets. Dont forget to show them a flyer of me on it as a proof that you have a personal relationship with me. This is also not forgetting those who are entitled to some complimentary tickets with a MAJOR preference of seating on the premium tables, kindly come with extra 9 friends each to make it a complete table. it would be a good time to let them know how you paid for the hall, accommodation, performing artistes, publicity, coverage and general production logistics, including my daughter's last school fees."